2015 Arterberry Maresh, Pinot Noir, Dundee Hills, Willamette Valley, Oregon. 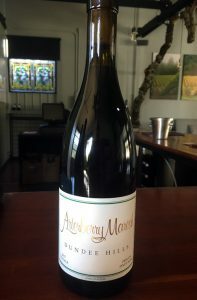 The Arterberry Maresh 2015 Dundee Hills Pinot is classic in style and with wonderful purity showing a deep color and the region’s exotic red spiciness to go along with the vintage’s ripe and opulent character. Winemaker and vigneron Jim Maresh is one of the newer stars on the Oregon wine scene crafting wines in the Dundee Hills AVA of the Willamette Valley. According to the winery, Jim Maresh has selected sites of predominantly old-vine, own-rooted and non-irrigated Pinot Noir (as well as Chardonnay) vines, which are farmed for the Arterberry Maresh wines along with a little bit of estate wine made from his own Maresh Vineyard as well, all set on southern facing hillsides with the regions signature Jory (Volcanic) soils. The area is result of thousands of years of volcanic uplift, flood and and erosion, which has given the Dundee Hills a beautiful landscape with lovely forests and iron rich red dirt, which adds to the unique character of the wines. In 2008, Martha Maresh and Steve Mikami began construction on the Powell Hill Winery. Named after the original pioneer family who farmed the land, the winery now sits at the highest point of Maresh Vineyard with an amazing view to the Cascades, and it was completed in time for the 2011 vintage. Jim founded his label in 2005 and has been getting a lot of buzz for his minimalist and light touch, he uses 100% de-stemmed fruit fermented in 1¼ ton lots, this style in the winery allows the intrinsic character of the wine to blossom with purity and life. According to Maresh the passive temperature management ensures spontaneous fermentation proceeds and it is monitored and guided by sensory analysis, gentle extraction techniques and low peak temperatures. Immediately upon reaching dryness, the lots are gently pressed in a half-ton wood bladder press and settle 2-4 weeks before being transferred to 5%-10% new French Oak barrels for 14-18 months. This 2015 delivers elegant layers of black cherry, plum and dark currant fruits on a medium/full palate that has silken mouth feel and lots of length, but with a studied sense of inner brightness with good acidity and mixed spices including red pepper, mineral notes, aromatic herbs, cedar, delicate oak notes and cinnamon. It gains detail and structure with air, as well as revealing floral elements both in the nose and the finish, lovely stuff and a great value in quality for well balanced Oregon Pinot Noir, drink over the next 3 to 5 years.